Written by: Malone on March 21, 2013. It’s been around since 9500 BC. One of the oldest man-made beverages, it’s shown up in ancient manuscripts and is thought to have been important in the development of civilization (according to Wikipedia – heh, heh). Though celebrated as the drink of the working man, it’s enjoyed by people of every socioeconomic level. It’s beer and the reason I bring it up, is that you just can’t celebrate St. Patrick’s Day without it. 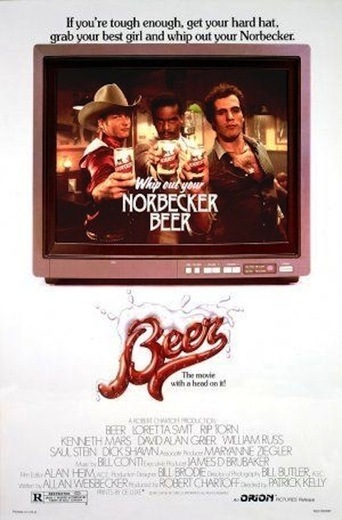 Day 5 of our week-long Irish holiday focuses on Orion Pictures’ 1985 film “Beer”. This little known comedy screams 80′s fun with a slobs vs. snobs story wrapped in a commentary on the advertising practices of the day. A movie about beer commercials? How could you possibly go wrong?? A.J. Norbecker has a problem. His company, Norbecker Beer, is hemorrhaging money. Frustrated by the poor ad campaign for his product, he tells the good people at The Feemer Agency that he’s going to bring his business elsewhere. A loss of the Norbecker account, being roughly 2/3rds of Feemer’s business, would surely mean the company’s demise. In a last ditch effort to keep his business, ad woman B.D. Tucker (Loretta Swit) pitches a new “macho” campaign aimed at the bluecolor American everyman. Something that’ll make the modern emasculated male feel manlier when he drinks it; like the Marlboro Man ads, but for beer. She taps Buzz Beckerman (Rip Torn), a washed-up commercial director who’s back on the wagon after years of hitting the bottle. As they discuss their approach in a local pub, they witness three schlubs thwart an armed robbery. As the media celebrates their bravery, Tucker recognizes the potential to cash in on these “average Joes” and quickly signs them to a contract. 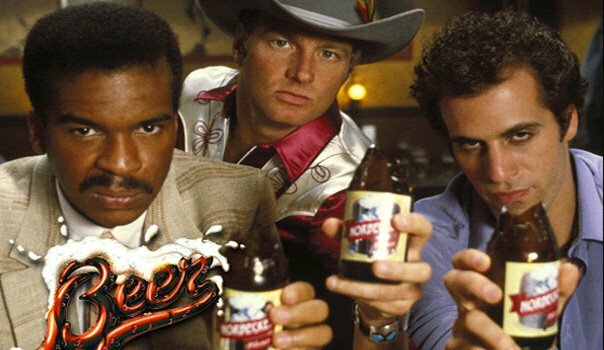 But coming off more like The Village People than macho hero types, Buzz must groom cowboy Merle (William Russ),corporate drone Elliot (David Alan Grier) and construction worker Frankie (Saul Stein) to become “Norbecker Men”. 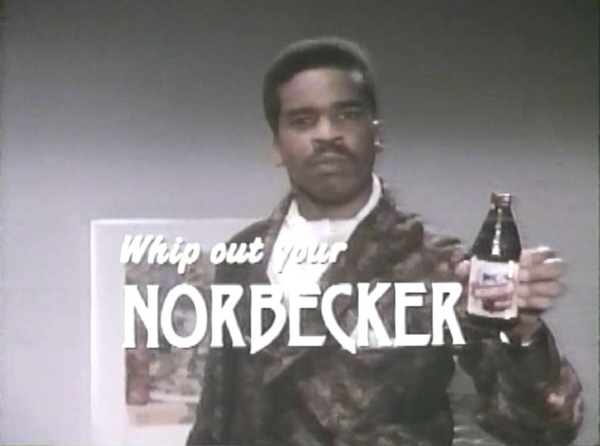 Soon the campaign takes off like a rocket with the suggestive slogan “Whip out your Norbecker”. But as the ads get more and more sexist and controversial, the men start to change, acting like their projected images. With the money machine running on overdrive, reality and hype are soon set on a collison course. Elliot (David Alan Grier) whips it out. Produced by Robert Chartoff (“Rocky”) during the heyday of the hedonistic beer commercial, the movie aims to show viewers that these idyllic images of bikini babes and rippling six pack abs are complete crap. No matter the product, the message is the same: drink this beer to be more of a man. Wear these shoes to jump higher and run faster. Drink this soda to dance better. Sadly, this tactic still exists today with products promising fame and fortune to the consumer like some sort of genie in a Coke bottle. 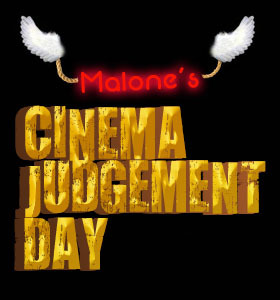 Whereas the movie’s point may have been fresher in the mid-80′s, it’s still relevant today – though generally disregarded by the masses who are fully aware of an ad’s mission. To watch “Beer” now, it’s almost sad to see the quaint (ultimately futile) warning sent to a society being consumed by consumerism. But that’s also what makes it fun. The film is nostalgic. Who doesn’t remember following the Bud Bowl or wearing a “Spuds Mackenzie” shirt. The hedonistic orgies found in beer commercials are as common now as pay phones, banned for being too un-PC and appealing too much to minors. It’s this carefree nature of “Beer”, with its fearless commercial parodies (soaked in crude sexuality), that embodies that era and makes us laugh at how much we really could get away with 30 years ago. Tonight, 3 of 4 devils are drinking “Beer”. While it may have lost a little of its fizz over the years, it’s still got enough kick to make you feel good. If you’re a fan of cheesy 80′s movies or are just feeling thirsty, this underrated guilty pleasure is certainly worth a taste.